Some dads are, in a word, awesome! And then there are some dads who take awesome to another level. Ryan Weimer, an Oregon father of five, takes awesome to another level through his non-profit Magic Wheelchair. Magic Wheelchair makes Halloween costumes for children bound to wheelchairs. The mission of Magic Wheelchair is "to give kids in wheelchairs an unforgettable Halloween by creating custom costumes for them at no expense to their families." The non-profit's vision is "to put a smile on the face of every child in a wheelchair by transforming their wheelchairs into awesomeness created by our hands and their imaginations." 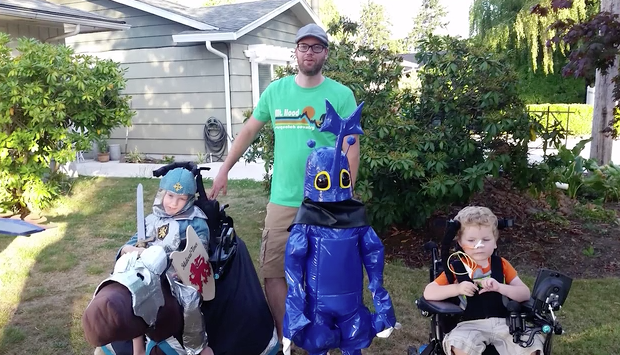 Every year, Magic Wheelchair selects five children for whom it builds costumes. You can read more about the genesis of Magic Wheelchair in this Today.com story, but the long and short of it is Ryan started to experiment with ways to make Halloween special for Keaton. Through trial and error, he learned how to create the costumes. Keaton loved them, and Ryan realized that other children like his son would love them, too. So he launched a Kickstarter campaign to raise money to start Magic Wheelchair. And the rest, as they say, is history--a wonderful history, in this case. To learn more about Magic Wheelchair, including how to submit a request for a costume or to support the organization, visit their website.